The Egypt v Uganda friendly in midweek saw the return to international football of Mohamed Aboutrika. The Egyptian playmaker, one of the key members in Egypt’s 2006 and 2008 Cup of Nations triumphs, had announced his retirement in the wake of the Port Said tragedy, where 74 fans died. In his second match back, after a substitute appearance for club side Al Ahly in the CAF Champions League against Ethiopian Coffee (you read that right), Aboutrika was an aerial threat throughout and eventually made Uganda pay by, fittingly, scoring the winner in injury time as Egypt recorded a 2-1 victory. 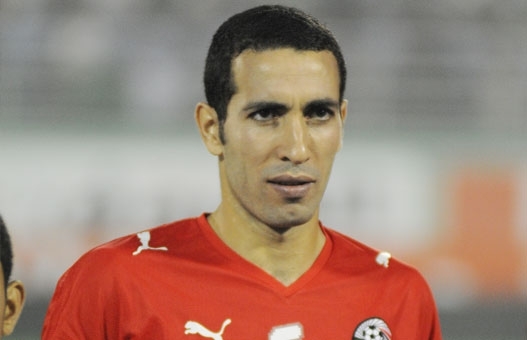 Despite being named the BBC African Footballer of the Year in 2008, Aboutrika has an obscure profile in Europe, by choice: firstly, Al Ahly have received offers but he has opted to stay at the Egyptian giants, showing gratitude that they made him who he is; secondly, to a much lesser extent, Al Ahly are regarded as the best supported club in Africa and the Arab world, Aboutrika gets paid well enough, that’s for sure. Whilst it’s impossible to fully expand on the qualities of Aboutrika here – as a player and as a human being – he is one of the symbols of what is good about modern Egypt. It's good to see him back. Back to the match, there was a mature, controlled performance in midfield from Hossam Ghaly against a Uganda side that was happy to soak up the pressure and counter. The best moment of the game, though, occurred when Shikabala distributed a delightful, inviting pass into the path of FC Basel-bound Mohamed Salah, who instantly controlled and dispatched with expert ease. As for Uganda, it was good experience for The Cranes as it was a team comprising of locally-based players. They took an early lead through debutant Fabian Kizito after a mix up between Mahmoud Fathalla and goalkeeper Essam El Haddary allowed the youngster an easy finish. In the English Premier League, two midfield heavyweights in the shappe of Cameroon’s Alex Song and Mali’s Samba Diakite, the incumbent Sandals For Goalposts’ Player of the Week, came head-to-head as relegation-threatened QPR beat high-flying Arsenal. In the midfield battle, it was Song who came out on top as he showed the poise in possession which has made him one of the best players in the Premiership in Arsenal’s revival. In a match where Arsenal were largely dominant on the balance of play, they still managed to lose and return to the calamitous Gunners that horrified us at the start of the season. Two defensive lapses by Thomas Vermaelen – the most overrated defender in the Premiership? – gifted the Rs the three points. The first gift was given to Morocco’s Adel Taarabt as, with his back to goal, he turned the Belgian easily before finishing low past Wojciech Sczczesny. It was the Moroccan’s first goal of the season, ending the terrible stat that he was the player with the most shots at goal (69) without scoring this season. The second Vermaelen gift was given to Jamie Mackie as a bouncing ball saw the Belgian slip and the ball fall to Mackie who gave the ball to Diakite who was lurking into the area. Taking advantage of the vast amount of space at his disposal (question marks have to be asked on where Alex Song was), Diakite finished into the roof of the net. Elsewhere in the Premiership, there were braces for Papiss Demba Cisse and Emmanuel Adebayor. Adebayor now has 13 goals and 12 assists this season, proving that he is one of the most complete strikers in the Premiership – how brilliant would he be if he could finish more of his chances!? He was a player who I considered long and hard in the 60 Greatest African Players list – not necessarily to be among the elite but to creep into the list, perhaps at in the late 50s somewhere, but inconsistency was his downfall when I considered him. His form this season is making me watch him closely, he has been the major difference for Spurs this season, in my opinion – I won’t elaborate on this here, may do a piece on it soon! The best performance, though, came from Benin’s Stephane Sessegnon as he was involved in all three of the Sunderland’s goals in their 3-3 draw against Manchester CIty; assisting Sebastian Larsson’s first, assisting Bendtner’s header when Sunderland regained the lead and his incisive ball finding Bendtner who found Larsson for his second of the game. In France, Sochaux completed a 2-1 win over Brest to give them their third win in four matches. Brest took 34th-minute lead when Bruno Grougi’s free-kick evaded everyone in the box and the unsighted goalkeeper Teddy Richert into the goal. Richert was forced off minutes later and replaced by 19-year-old Senegalese keeper Papa Demba Camara. The thin-thighed keeper automatically acquired cult-hero status, his every save and plucked cross followed by cheers from the home crowd. Mali’s Modibo Maiga rose high to meet Algeria’s Ryad Boudebouz’s cross and power a header past Brest keeper Steve Elana to level the game. Slovan Privat completed the comeback with a header of his own after a lovely cross by Marvin Martin. Guinea’s Abdoul Camara and the wonderfully-named Yaya Banana, of Cameroon, were also on the pitch for, Camara showed the ability to take on players which made him one of the standout players at the 2012 Cup of Nations, although his decision-making in the final third was disappointing.